English people are well acquainted with the fact that they send missionaries to India's "coral strands". Indeed, so thoroughly do they obey the behest, "Go ye forth into all the world and preach the Gospel", that none of the chief British sects are behindhand in obedience to the call to spread Christ's teaching. People are not so well aware that India also sends missionaries to England. By accident, if the term may be allowed, I fell across the Swami Vivekananda in his temporary home at 63 St. George's Road, S. W., and as he did not object to discuss the nature of his work and visit to England, I sought him there and began our talk with an expression of surprise at his assent to my request. "I got thoroughly used to the interviewer in America. Because it is not the fashion in my country, that is no reason why I should not use means existing in any country I visit, for spreading what I desire to be known! 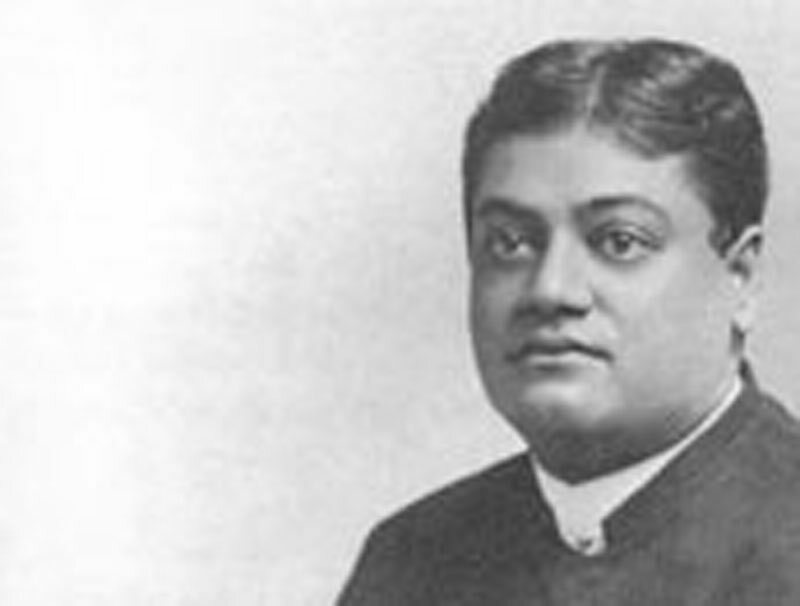 There I was representative of the Hindu religion at the World's Parliament of Religions at Chicago in 1893. The Raja of Mysore and some other friends sent me there. I think I may lay claim to having had some success in America. I had many invitations to other great American cities besides Chicago; my visit was a very long one, for, with the exception of a visit to England last summer, repeated as you see this year, I remained about three years in America. The American civilisation is, in my opinion. a very great one. I find the American mind peculiarly susceptible to new ideas; nothing is rejected because it is new. It is examined on its own merits, and stands or falls by these alone." "Whereas in England — you mean to imply something?" "Yes, in England, civilisation is older, it has gathered many accretions as the centuries have rolled on. In particular, you have many prejudices that need to be broken through, and whoever deals with you in ideas must lay this to his account." "So they say. I gather that you did not found anything like a church or a new religion in America." "That is true. It is contrary to our principles to multiply organizations, since, in all conscience, there are enough of them. And when organizations are created they need individuals to look after them. Now, those who have made Sannyâsa — that is, renunciation of all worldly position, property, and name — whose aim is to seek spiritual knowledge, cannot undertake this work, which is, besides, in other hands." "Is your teaching a system of comparative religion?" "It might convey a more definite idea to call it the kernel of all forms of religion, stripping from them the non-essential, and laying stress on that which is the real basis. I am a disciple of Ramakrishna Paramahamsa, a perfect Sannyâsin whose influence and ideas I fell under. This great Sannyasin never assumed the negative or critical attitude towards other religions, but showed their positive side — how they could be carried into life and practiced. To fight, to assume the antagonistic attitude, is the exact contrary of his teaching, which dwells on the truth that the world is moved by love. You know that the Hindu religion never persecutes. It is the land where all sects may live in peace and amity. The Mohammedans brought murder and slaughter in their train, but until their arrival peace prevailed. Thus the Jains, who do not believe in a God and who regard such belief as a delusion, were tolerated, and still are there today. India sets the example of real strength, that is meekness. Dash, pluck, fight, all these things are weakness." "It sounds very like Tolstoy's doctrine; it may do for individuals, though personally I doubt it. But how will it answer for nations?" "Admirably for them also. It was India's Karma, her fate, to be conquered, and in her turn, to conquer her conqueror. She has already done so with her Mohammedan victors: Educated Mohammedans are Sufis, scarcely to be distinguished from Hindus. Hindu thought has permeated their civilisation; they assumed the position of learners. The great Akbar, the Mogul Emperor, was practically a Hindu. And England will be conquered in her turn. Today she has the sword, but it is worse than useless in the world of ideas. You know what Schopenhauer said of Indian thought. He foretold that its influence would be as momentous in Europe, when it became well known, as the revival of Greek and Latin; culture after the Dark Ages." "Excuse me saying that there do not seem many signs; of it just now." "Perhaps not", said the Swami, gravely. "I dare say a good many people saw no signs of the old Renaissance and did not know it was there, even after it had come. But there is a great movement, which can be discerned by those who know the signs of the times. Oriental research has of recent years made great progress. At present it is in the hands of scholars, and it seems dry and heavy in the work they have achieved. But gradually the light of comprehension will break"
"And India is to be the great conqueror of the future? Yet she does not send out many missionaries to preach her ideas. I presume she will wait until the world comes to her feet?" "India was once a great missionary power. Hundreds' of years before England was converted to Christianity, Buddha sent out missionaries to convert the world of Asia to his doctrine. The world of thought is being converted. We are only at the beginning as yet. The number of those who decline to adopt any special form of religion is greatly increasing, and this movement is among the educated classes. In a recent American census, a large number of persons declined to class themselves as belonging to any form of religion. All religions are different expressions of the same truth; all march on or die out. They are the radii of the same truth, the expression that variety of minds requires." "Now we are getting near it. What is that central truth ?" "The Divine within; every being, however degraded, is the expression of the Divine. The Divinity becomes covered, hidden from view. I call to mind an incident of the Indian Mutiny. A Swami, who for years had fulfilled a vow of eternal silence, was stabbed by a Mohammedan. They dragged the murderer before his victim and cried out, 'Speak the word, Swami, and he shall die.' After many years of silence, he broke it to say with his last breath: 'My children, you are all mistaken. That man is God Himself.' The great lesson is, that unity is behind all. Call it God, Love, Spirit. Allah, Jehovah — it is the same unity that animates all life from the lowest animal to the noblest man. Picture to yourself an ocean ice-bound, pierced with many different holes. Each of these is a soul, a man, emancipated according to his degree of intelligence, essaying to break through the ice." "I think I see one difference between the wisdom of the East and that of the West. You aim at producing very perfect individuals by Sannyasa, concentration, and so forth. Now the ideal of the West seems to be the perfecting of the social state; and so we work at political and social questions, since we think that the permanence of our civilisation depends upon the well-being of the people." "But the basis of all systems, social or political," said the Swami with great earnestness, "rests upon the goodness of men. No nation is great or good because Parliament enacts this or that, but because its men are great and good. I have visited China which had the most admirable organisation of all nations. Yet today China is like a disorganised mob, because her men are not equal to the system contrived in the olden days. Religion goes to the root of the matter. If it is right, all is right." "It sounds just a little vague and remote from practical life, that the Divine is within everything but covered. One can't be looking for it all the time." "People often work for the same ends but fail to recognise the fact. One must admit that law, government, politics are phases not final in any way. There is a goal beyond them where law is not needed. And by the way, the very word Sannyasin means the divine outlaw, one might say, divine nihilist, but that miscomprehension pursues those that use such a word. All great Masters teach the same thing. Christ saw that the basis is not law, that morality and purity are the only strength. As for your statement that the East aims at higher self-development and the West at the perfecting of the social state, you do not of course forget that there is an apparent Self and a real Self." "The inference, of course, being that we work for the apparent, you for the real?" "The mind works through various stages to attain its fuller development. First, it lays hold of the concrete, and only gradually deals with abstractions. Look, too, how the idea of universal brotherhood is reached. First it is grasped as brotherhood within a sect — hard, narrow, and exclusive. Step by step we reach broad generalizations and the world of abstract ideas." "So you think that those sects, of which we English are so fond, will die out. You know what the Frenchman said, 'England, the land of a thousand sects and but one sauce'." "I am sure that they are bound to disappear. Their existence is founded on non-essentials; the essential part of them will remain and be built up into another edifice. You know the old saying that it is good to be born in a church, but not to die in it." "Perhaps you will say how your work is progressing in England?" "Slowly, for the reasons I have already named. When you deal with roots and foundations, all real progress must be slow. Of course, I need not say that these ideas are bound to spread by one means or another, and to many of us the right moment for their dissemination seems now to have come." Then I listened to an explanation of how work is carried on. Like many an old doctrine, this new one is offered without money and without price, depending entirely upon the voluntary efforts of those who embrace it. The Swami is a picturesque figure in his Eastern dress. His simple and cordial manner, savouring of anything but the popular idea of asceticism, an unusual command of English and great conversational powers add not a little to an interesting personality. . . . His vow of Sannyasa implies renunciation of position, property, and name, as well as the persistent search for spiritual knowledge.